Interior automotive components manufacturer Johnson Controls (JCI) is providing door panels, seat structures and instrument clusters for the new BMW 3 series, made using a combination of natural fibres and PP that is 20% lighter than conventional components. The parts are said to help reduce fuel consumption, while using renewable materials. The driver�s seat structure saves 3 to 4 kg, depending on the model. And JCI said the instrument cluster features an Automotive Pixel Link (APIX) high-speed, point-to-point connection. Non-visible door panel elements for the BMW 3 series sedan and sports wagon models are largely made of wood fibre. The natural fibre carrier is directly moulded with PP, which makes the door panel �considerably lighter,� the company says. 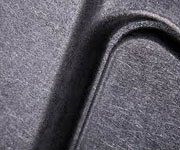 A process called groove lamination is used to apply fabric or leather trim to the door panel, with the trim being joined in recesses, eliminating the need for an additional component and further reducing weight.